The apparition of an unidentified flying object caused a commotion in Tarapacá on Thursday night. The luminous object was seen throught the region, particularly in the Cavancha and Playa Brava sections. 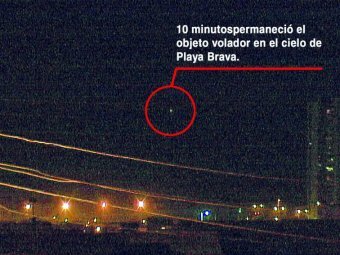 Professional photographer Marco Pardo captured the exact moment in which a large flashing light hung motionless in the sky over Playa Brava. "It was strange at first, because the intensity of its light waxed and wanted, but it didn't move at all," Pardo explained. His camera captured the precise moment in which the UFO moved from north to south and viceversa, remaining visible in the heavens for nearly 10 minutes. "There's a moment in which this light travels rapidly from one place to another, only to vanish to the north," added the photographer. The sighting occurred after 23:00 hours on the coast of Iquique. The image was taken from the balcony of his home, located at Los Molles on the corner with Cerro Dragón. Ufologist Mario Pizarro believes that this sighting is another of many recorded over the city in recent times. "These are cyclical times, when the sky has been clear at night, facilitating the sighting of these objects," he explains, adding that UFOs are "prototypes of luminous ships that behave in a very special manner in the sky." A description similar to the one given by the cameraman who took the photos. Regarding research after the event, Pizarro stated that he is working on it and a series of other sightings, including on in Alto Hospicio and the confirmed sighting of a UFO in the skies of Chile's Second Region, specifically Antofagasta. The possibility that it could be the same flying object seen over the Iquique coastline is not being dismissed.